NEW YORK — It is a very small sample size, but raise your hand if you had the New York Islanders allowing fewer than two goals per game over the first week of the season — or for any week of the season for that matter — following last year’s all-around defensive cluster? Well, the team that treated their own end of the ice like a minefield a year ago while surrendering a league-worst 296 goals has allowed only five in three games, so far, in 2018-19 after Monday’s 4-0 home-ice matinee shutout over the San Jose Sharks. “It’s about defensive structure, but above all it’s about effort and commitment,” Islanders captain Anders Lee explained. “You can tell it’s there and that every guy takes pride in it. Last season, the Islanders produced enough offense to be a playoff team. Their 264 goals were fifth most in the Eastern Conference. Yet the Isles finished in 11th place, 17 points out of the final postseason berth in the East, because of their fairly atrocious defensive play and subpar goaltending. As a result, Doug Weight lost his job as head coach, joined on the job-seekers line by long-time general manager Garth Snow. The pair were replaced by Barry Trotz and Lou Lamoriello, a pair of Stanley Cup winners who immediately stressed the importance of committing to better overall team defense. Structure is the buzz word around the Islanders this season. Last year, structure was a word rarely used when describing the chaotic ways of the Isles. “Structure is your safety blanket,” Trotz offered Monday. His team displayed plenty of it in beating the Sharks. Positionally sound throughout in their own end, the Islanders thwarted one pass and shot attempt after another from the slick puck-movers on San Jose’s blueline. 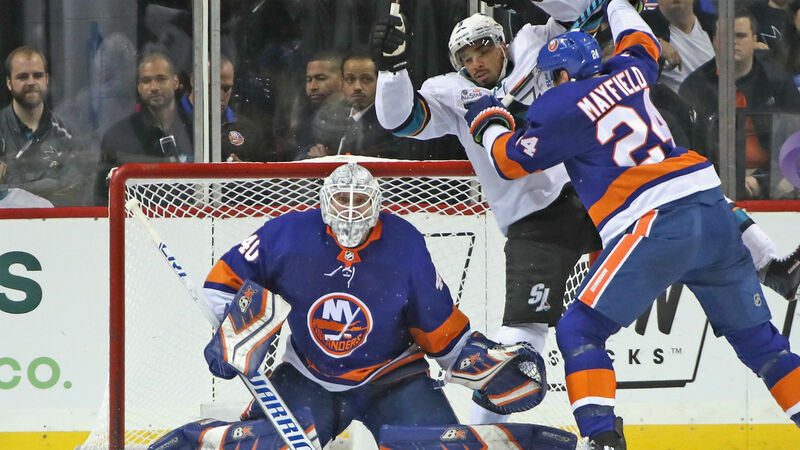 The Islanders also did not let the skilled Sharks fly through the neutral zone unchallenged. There was structure and commitment to playing a smart reliable defensive style in what was a tight 1-0 game until New York scored three times in the final period. “We played hard,” said rugged forward Matt Martin, one of the third-period goal scorers. “I think that’s what the coaching staff is trying to instill in our team — there’s no nights off, there’s no floating around, no 6-5 or 6-4 type games where it’s just end to end scoring. It’s not all perfect, of course, in this post-John Tavares era for the Islanders. They allowed four goals in a 4-3 loss to the Nashville Predators on Saturday and it took a stellar 45-save effort from goalie Thomas Greiss — he of the 3.82 GAA last season with the Isles — to secure a 2-1 overtime win in Carolina on opening night. While Monday was the team’s best all-around defensive effort of the young season, the Islanders still needed solid play from their goaltender to skate away with two points. They got exactly that from Robin Lehner, who stopped all 35 shots in his Islanders debut after signing as a free agent this summer. With the Islanders holding a slim 1-0 lead early in the third period, Lehner turned in his best work. San Jose outshot New York 6-0 to open the period with Lehner denying rookie Rourke Chartier point-blank from the slot and following moments later with a pair of quality pad saves on Marc-Edouard Vlasic shots through traffic. Shortly thereafter Lehner displayed quick reflexes to kick out a Melker Karlsson deflection and an open look for Tomas Hertl from between the circles. That 35 save, 4-0 shutout feeling. ? That set the stage for the Islanders scoring a fluky goal off the stick of Scott Mayfield at the other end, a 2-0 lead en-route to a 4-0 victory. “We all bought in, paid the price,” explained Lehner. It’s only three games, but the difference is obvious. “We’re building towards something,” said Martin.